A scarf is the go-to item in today’s fashion world. They are the best and most versatile accessory to add flourish to any outfit. Now you can add embellishments through hot-fix crystals and metals to create an even more eye-catching accessory. 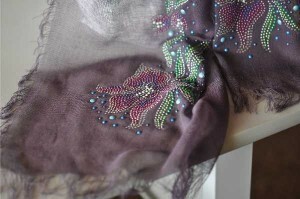 Crystals can match or contrast the underlying fabric. 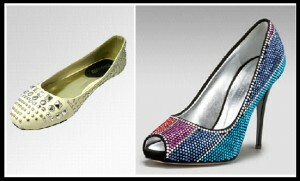 The hot-fix crystals and metals can pull together any number of outfits with your favorite colors. >A household iron, at wool setting. 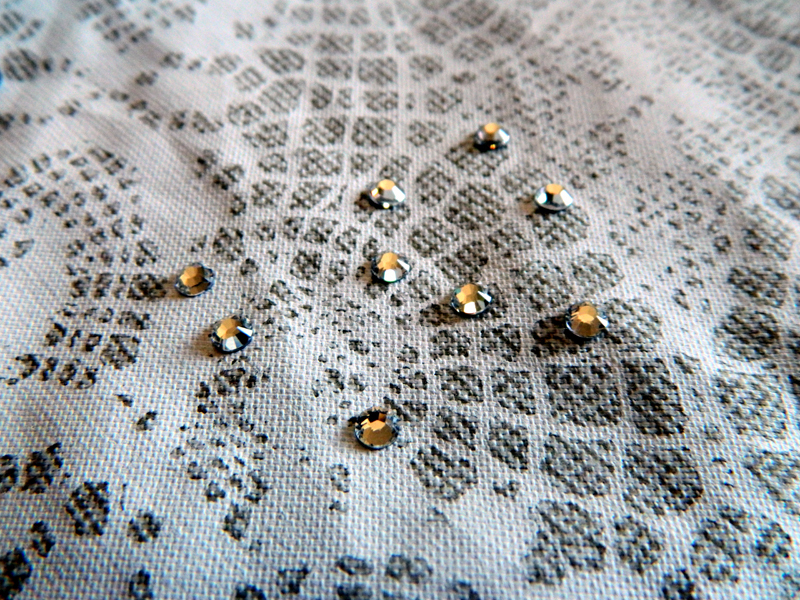 >An iron-on motif made with hot-fix crystals and metals. Lay the first non-stick pressing cloth on the hard surface. Lay one end of the fringed fabric on top of the non-stick pressing cloth, this is necessary, because you will be melting glue onto and through the fabric. Peel off the backing of the iron-on motif and place on the fabric. 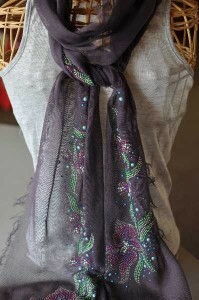 You can cut the motifs apart and play with the arrangement of the elements on your scarf. Cover the iron-on motif plastic with the second non-stick pressing cloth, as this will keep the hot iron from scorching the scarf. Adjust the household iron to the wool setting, this is the third highest setting on most irons. Place the hot iron on top of the second pressing cloth on top of the design, and leave in place for 45 seconds. If the design is larger than the sole plate of the iron, lift and replace iron to melt the glue on the next section of the iron-on motif, repeat step 6 until the whole motif has its glue melted. Lift the cooled scarf off the non-stick the first press cloth with the motif plastic still in place. The plastic will help to stabilize the fragile fabric as the hard glue releases from the non-stick cloth. Now everything is cool, use your hot iron to sweep over the motif to warm the plastic a little. This will ease the removal of the plastic from the fragile gauze fabric. Gently pull the warmed plastic, slowly, off the scarf and the hot-fix crystals and metals will remain in place. If a piece was missed it will come up with the plastic. Don’t panic, simply put the plastic back down and melt the glue on the missed piece and let cool. Do this by using the tip of the iron on the single piece(s). Let cool and continue to remove the plastic. Put On Your Fancy Dancing Shoes! 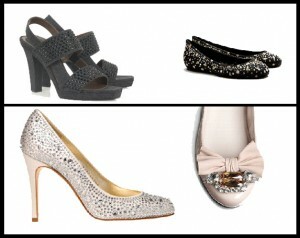 Canvas, velvet, unsealed suede or fabric ballet flats. No leather or plastic material. I have gone to GAP, Target and Forever 21 for some great finds! Package of hot-fix metals and/or hot-fix crystals, an assortment is best. Don’t forget your Bejeweler! 1) I like to begin with a brainstorm. When you apply the metals and/or crystals they are permanent so you want to get it right! You want to stay to two areas of the shoe only, the top of the toe and the back of the heel. If you scatter the crystal or metals along the inside part of your shoes, it will be in the direct path of wear your feet tend to scuff together. I like to place a few very large pieces of crystal of metal on the toe as an attention grabber. When these peek out from under your jeans you will be so tickled. 2) After I have a good idea of how I want the finished product to be I begin! I start with affixing the large pieces first and then work my way down in size to fill in the gaps. See Bejeweler tips & instructions below. 4) This is a seriously easy craft and the results are absolutely fabulous. Prepare yourself for plenty of complements! Before you plug in your Bejeweler, choose the correct size tip to match the rhinestone you are using. Tips are etched on the side with the size number. 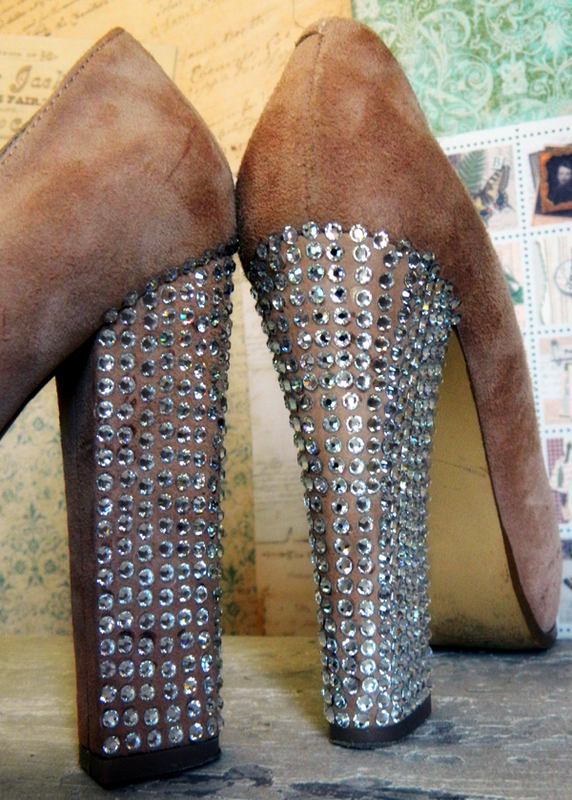 If in doubt, place the tip over the rhinestone. It should pick up the rhinestone. Gently screw the tip into the end of the Bejeweler. Prepare your work surfaces and, if applying to fabric, use a firm, flat surface. 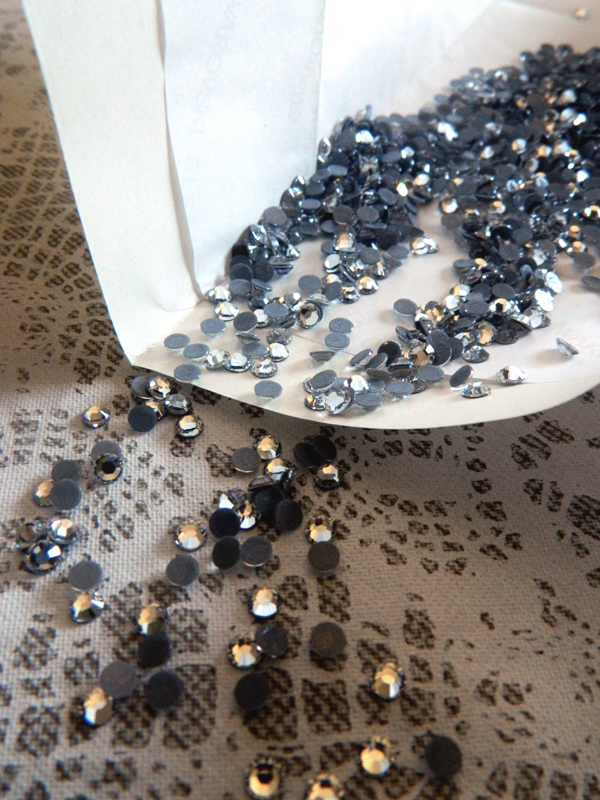 For sheer fabrics, place a PTFE sheet under the fabric or between layers or the rhinestone may bond the surfaces together. Allow the Bejeweler to heat for 3 – 5 minutes. 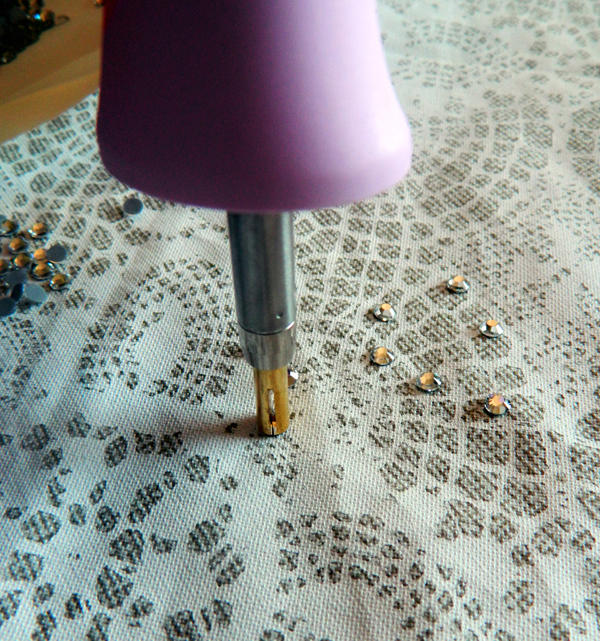 Place the rhinestones (face up) on a flat, hard surface. Gently place the tip over the rhinestone – do not push down. The tip will pick up the rhinestone for you. Allow the heat to melt the glue on the back of the rhinestone – the glue will begin to look wet. Small stones take very little time – larger stones will require more time. 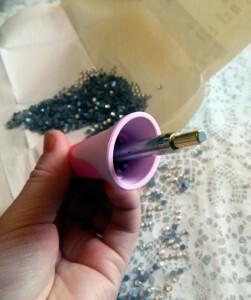 Place the rhinestone onto the surface of your item and immediately lift the tip up. The tip of the tool should not be held onto the surface of the item. Turn the tip of the tool to the side and gently press the crystal down to make certain it is tightly adhered to the surface. Always iron on a hard, flat surface (no padded ironing board). Lay out your shirt. Heat Press: Iron for 10-15 seconds at 350 degrees Fahrenheit using light to light medium pressure. If you are using cabochons, make sure to turn the shirt inside out and press again from the wrong side. Let it cool, remove plastic and press again with more pressure. You can also turn it inside out and press from the wrong side. No responsibility is taken for the reliability of your iron. Irons may heat up after being used for awhile. We also have cutout designs: a rainbow, large and small cut-out star, small stars, small butterflies, large butterfly, small Christmas bulbs, bear paw quilt pattern, ex-large wreath, lightning bolt, poinsettia. These are super easy to use and very fast. They are already cut out for you! They range in price from $3.00 to $16.00. As much as we hate to say this, we think the sequins should be air-dried. They will last longer if they are not put into the dryer. Iron-on pearls come in white, cream & blue in sizes 10ss, 16ss, and white & cream in size 34ss. They are the same prices as the colored crystals in similar sizes. Size 6ss and 10ss crystals will iron on easily with the metals, so feel free to change any metal pieces in a design for the crystals. 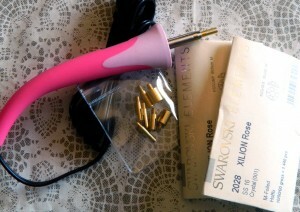 But with larger crystals (I 6ss and up), you should iron them on in a second step. It’s easier to iron on flat metal pieces, (better iron contact), then to try to work around large crystals. If a design comes with 16ss crystals or larger, peel off the crystals, iron on the metals, peel off the plastic – make sure that the metals are adhering properly, and then iron-on the crystals. A popular example is the peacock. Peel off the backing, and remove the 4mm metals inside the moon shapes, in his tail, and the 3 3mm metals at the top of his head. Save these metal pieces for another project. Iron on the peacock. Remove the plastic, iron from the backside, and make sure the pieces are securely bonded. Test with your fingernails for security. Now place the 16ss crystals inside the moon shapes, cover with a pressing cloth, and iron for a minimum of 45-60 seconds. Make sure the glue is melted. They won’t be secure if it isn’t. Place the 3 10ss crystals at the top of his head. Iron them on. You’re done! Now thank everyone for all the compliments you will be receiving. 1. To make your own design you’ll need loose pieces, tweezers, a piece of silicon/mylar tape, (all of which you can purchase here!) a hard flat surface, utility tape, a sketch of what you want to lay out. I like to work on a small cutting board so that I can turn it to work around the design. I also like to lay the loose pieces out on something that I can lift and move too. 2. You will need to separate the white backing from the sticky back silicon/mylar, probably the most difficult part of the process. Set the white backing aside for now. 4. You will be working with the pieces face side down, glue side up. Using the tweezers follow the outline of your sketched design. 5. Keep the spacing of the pieces even and not too close. The reason I like to use a movable work surface is important here, as I can use the side of the tweezers to fit in between the pieces. I rotate the board so that the tweezers always fit into the space between the piece I hold and the piece already in place. Another tip is to work from the center out. The flower center (yellow) is always placed first, and then I can space the petal pieces around it. 6. Place the white backing on the completed design for storage until you are ready to iron it in place on your project. 7. When you are making a word motif, you’ll always work with the design in mirror image. You are working face down. We are now uploading hundreds of images to show you what you can easily do with the various sparkling designs located on our Hot Fix Iron on Designs page of our store.